It's the smartest, most sustainable choice for cleaning your coffee bean grinder: Urnex's Full Circle Grinder Cleaner. Why? Because it's is chock full of naturally occurring ingredients and free of harmful (and hard-to-pronounce) chemicals. Run the Urnex Full Circle Grinder Cleaner through your burrs every few weeks to ensure the freshest espresso and coffee yet. These pellets are wheat-based and may not be suitable for those avoiding gluten. FYI: Grindz is gluten-free, Full Circle is not. Every ingredient is edible and either used to bake bread, prepare your favorite breakfast cereal, or in the case of the food-safe binder a key ingredient in toothpaste. Not a gluten-free product. 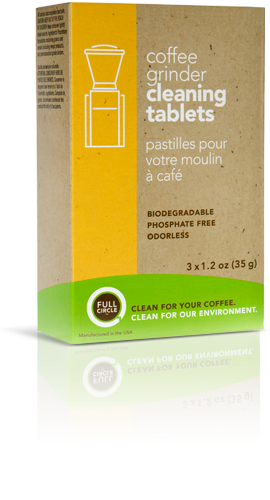 Full Circle Coffee Equipment Cleaning Tablets - 120 Ct.